As the name suggests, the Green View Garden offers you a glimpse into nature and its picturesque beauty. 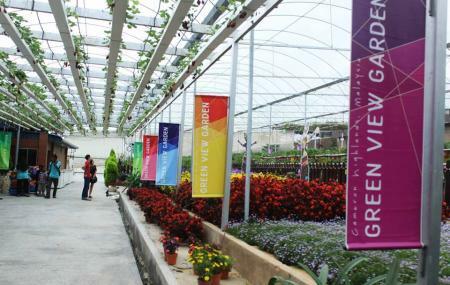 Inside this garden, there is a flower nursery where you can spot varieties of flowers. It also operates as a strawberry farm offering succulent ones to the visitors. The signature brand of this farm is the ‘Avant' chocolate', which attracts a many. To satiate your hunger, there is a spacious cafe for snacks and refreshments. In addition to that, there is a shop from where you can purchase local products, including tea, cookies and souvenirs. How popular is Green View Garden? People normally club together Highlands Apiary Farm and Lost World Tambun while planning their visit to Green View Garden. Many beautiful flowers and baby birds are available here. There are some strawberry-based food and desserts too. All the commodities are well maintained. Small place with overpriced stuff, average food and lots of annoying flies. Entering the small animal feeding area for rm10 and even charge u to go into the dirty toilet. Better go to the lavender farm near tringkap. The place is very nice but you can't bring out site food (will be charged RM50), toilet facilities RM0.20/head. Recommend to stop by on the way back from Cameron highlands. Serve great foods. And have well maintained surroundings.